Unhappy with your horse fence’s appearance? Turn either your oak, CCA, or faded creosote fence into a nice, fresh, Kentucky black! Enhance your horse fence with coatings by NuTone Painting Systems (NPS). 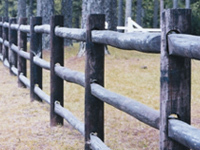 NPS has been restoring and revitalizing fences for General Timber customers for nearly 25 years. NPS fence coatings services provide the opportunity to amplify an oak, CCA or faded creosote fence by turning it into a striking Kentucky black. In addition to reinforcing your horse fence’s appearance, coatings from NPS’s services offer the protection necessary in maintaining its longevity; this is the perfect solution to those looking to restore a weathered fence. General Timber Inc. is a family-owned company based in North Carolina that operates on the notion of offering a valuable product at a reasonable price. Our staff works hard to produce the highest quality products without compromising the environment. We also take great pride in working with contractors who will provide you with quality, affordable services on your farm. From horse fence installation to board and rail fence coatings, we bring decades of experience to each project. Operating as a green company, we appreciate the environment in addition to the animals and people in it. Rest easy knowing that all coatings are environmentally friendly and safe for your family farm and all of its livestock. To receive a free estimate for horse corral & fence coatings, please contact NuTone Painting Systems at 910-695-5743 today. Seven years ago we built almost a mile of four board, white oak pasture fence at our farm in Granville County, N.C. We found NuTone Painting Systems through General Timber, Inc. and contracted with them to coat our fence. They told us we could expect about seven years before needing to repaint. That was a good estimate. We just had Greg William's crew out again. As with our first experience seven years ago, we got a quality job from an efficient crew lead by foreman Freddie Hernandez- who is always professional and enjoyable to work with. With all the maintenance to handle in the country, it is nice to have a reliable resource to call upon and know they will perform.